Staff and pupils at Morpeth First School were very happy to welcome representatives from Morpeth Town FC into school to present them with items made for them by the children. A large number of its pupils take part in sport in the local community and, most particularly, in football. They have been very interested in the progress of the team in the FA Vase and the school wanted to mark the occasion of the final with them. 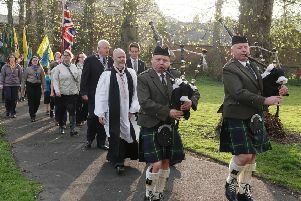 A Morpeth First School spokeswoman said: “They were keen to send their wishes and have enjoyed preparing for the visit. “Beth Robinson, one of our teaching assistants, has close links with the club and made arrangements for representatives to collect good luck messages from the children. Beth’s son Cameron and his friend Kieran, who are ex-pupils, have been chosen as mascots for the game. “This is an exciting time for the club and for its supporters and we hope that this project has raised awareness of the club and its achievements this season with the children and their families.